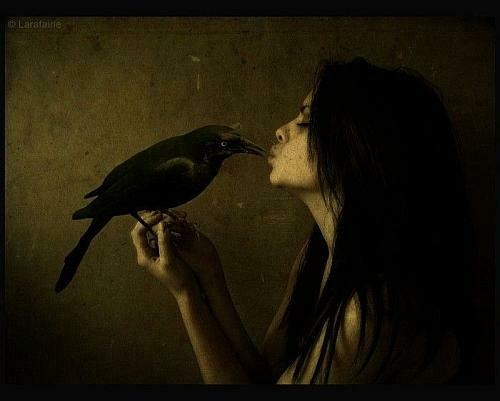 …all my life I have been fascinated by the incredible being, Raven …as I write, one sits on the roof above me, peering down through the sky light, her blue eyes, deep, with uncanny intelligence …why do they hold such mystery to so many? …I have enjoyed following their imagery through history and back through the archives of my own imagination, to the shape shifting qualities that, somehow, have crawled, (or rather perhaps, flown), into my story line and my life. …recovering from an operation and a wee bout of recent (and rare) ill-health has given me time to really look at life and at the beings that include themselves; crowd themselves, into my psyche to create yet more amazing creatures with gifts that I actually sense can exist within us waiting to be birthed …for where does our imagination truly stem from if not from a myriad of experiences that can in turn create anew. …writing about these creatures is called however, ‘fantasy’ …does it mean ‘made up’ or does it mean that, as with all things, where our mind goes, energy flows and thus, we birth these beings into life and then …with each reader who grasps a story in its entirety; embracing a new character/creature …so in turn the entity is taken another step …and another into realisation? A scary thought then would be that, with the rush of Vampire and Daemon stories in the making and the almost, ‘paranormal craze’ that’s occurring, are we in fact bringing creatures into the light of day that many would, I’m sure, prefer remained in the perceived darkness …this of course, in turn brings me to the thoughts about the ancient stories of the Fae …the Sidhe and Unsidhe (Sthee and Unsthee) and the somewhat disturbing legends of their rather contrary nature. …I do think that wherever we come from on the planet, (and beyond), we have a certain link with the mythology that is present in and around our country of birth, through the archetypal imagery that connects us but …what if those connections opened doorways right across the world …networks …tapestries of threads to follow that criss-cross the country even when there are no real, mythological association present, other than through a person’s psyche. ...we are each just a little thread in the tapestry of life…beware you don’t drop a stitch ‘cos we might all begin to unravel. Said, (with a very cheeky chuckle)…by Tara Saark. Tara rested against a huge old chestnut tree in Flora’s orchard. She could have climbed, she thought, higher and higher taking in the view as she climbed. She could have flown but that would have “blown her cover,” she giggled. How could she tell even these clever women that she was a piece of the Mother’s Magicks? Small, strong and wiry she resembled a dark bird. Her hair, prematurely streaked in the front with a slash of silver, made her stand out in any crowd. She had an air of indifference about her that fooled people into thinking that she was just a ‘street-wise’ kid, the truth was she was older than most could imagine. She’d first come in contact with Sybille years ago and had been intrigued, when she heard from Annie, that Flora, Bethan, Maeve and Samantha had been looking for her because Sybille had left a note for her before disappearing. The breeze had told her where Sybille had gone although soon she sensed they would have to work it out for themselves. Her task was to observe, it was not for her to interfere with the will of the Mother. She waited unable to resist climbing to the very top of her gnarled old friend, suspended in her customary state of bliss for the girls to all arrive and then she would walk to the door like a regular human, she giggled again. Watching from her lofty perch she saw Flora arrive, unload bags of groceries and head to the house, stopping to stroke Teddy who was waiting at the gate for her. Tara knew that the meal tonight would be as good, if not better than Sybille herself would have prepared, except Sybille would know to leave out a plate of raw meat for her Corbae friends to enjoy. Within a short space of time the others arrived, Maeve and Samantha together, chattering to each other about their day, seemingly relaxed in each other’s company. She wondered, with the natural curiosity of her kind, how they would cope with tasks that would be set for them by Samhain. Allowing them a little time to ready themselves, with unaccustomed patience but knowing the conventions of the humankin that guests should never arrive early, she lazily shifted shape and flew to the gate to land in a flurry of feathers as she realised that The Cat was sitting on the other gate post. A spitting Morgana launched herself from the post and disappeared through the cat flap into the house. Tara, recovering herself hurriedly, changed back into her human shape, smoothing her ruffled hair to no avail and straightening her layered clothing of lace and tattered silks, walked sedately to the door and knocked. Eyeing each other, Flora, recovering her composure, opened the door wide and asked Tara in, not knowing that those of her kind needed permission before they could cross a human’s threshold and could not enter without it. Sensing Flora’s discomfort Tara reached out gently with her mind and sent a small frisson of energy to calm her nervousness, at the same time stepping inside closing the door firmly behind her. Flora led Tara in and again Tara laughed to herself at the sound of scurrying as the other two women made a show of pouring drinks and putting bowls of nuts on the table before turning, unhurriedly, to greet her as if totally unperturbed. “This is Tara,” announced Flora unnecessarily to Bethan and Samantha. “Merry meet Fae sisterling,” so that only Bethan could hear. Taken aback at this, Bethan quickly withdrew her hand, smiling faintly in wonder at the beautiful but mysterious essence of the woman before her. …I have lived in Australia 32 years but my own experiences always lead me back to my Celtic roots, no matter how deeply I may delve, into the Aboriginal Dreamtime. There have been a few dreams where I have experienced local connections with creatures that I have had no name for, until finding a source to help me identify them …mostly though, my psyche remains full of the images from childhood, together with my own visions of creatures and beings that come from …where exactly? …how delicious it is to, sometimes, …not know! Any idea who the artist is that did Raven’s Kiss? No sorry I don’t and it doesn’t seem to come in tineye.com either!